Baby Gourmet, natural organic baby food is now available to purchase at Walmart® stores across the United States. Before distributing their product to Walmart® stores, Baby Gourmet was only available for US consumers to purchase online. 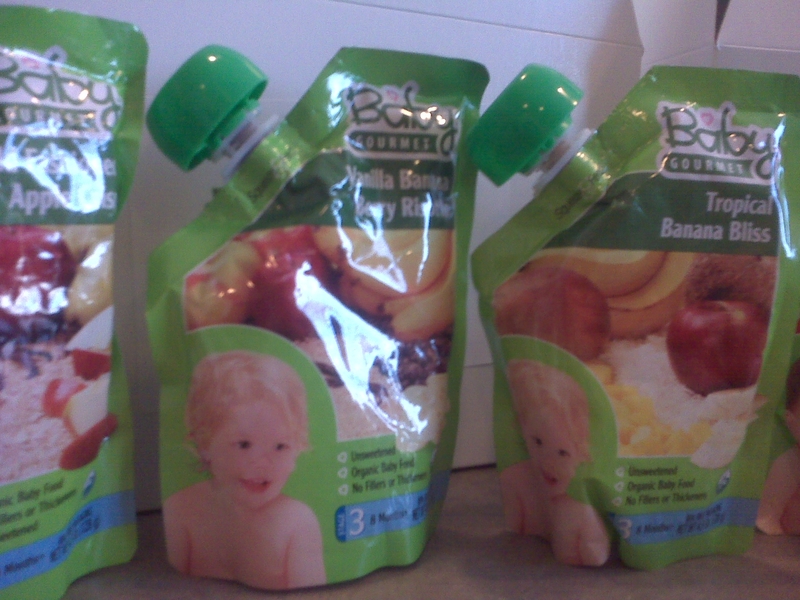 My ten month old, Camrin and I had the opportunity to try out Baby Gourmet Baby food. The baby food comes in three stages, simple purees for 6 months+, yummy combos for 7 months+, and tasty textures for 8 months+. All of their products are organic with no thickeners or fillers, no added sugar, no added salt, kosher, BPA-free, re-sealable packaging and have USDA, FDA and organic certification. 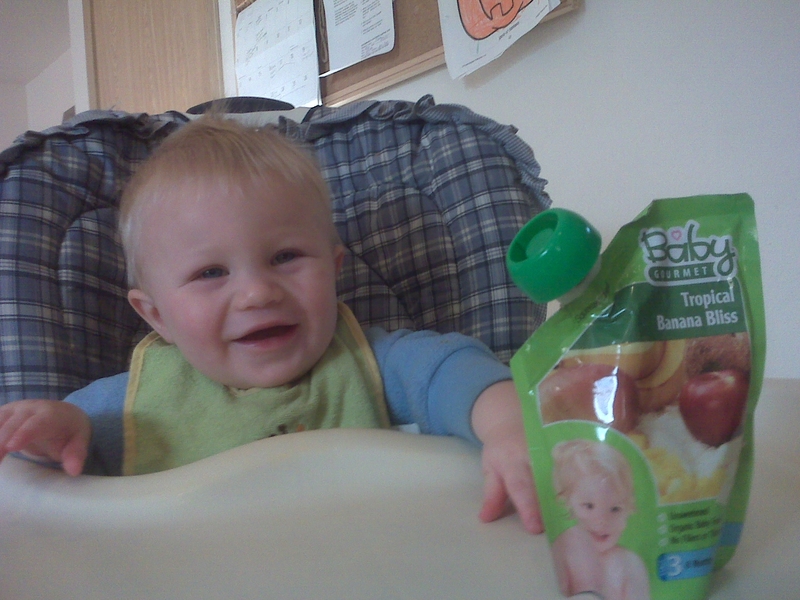 You know that your baby is getting the best nutrition with Baby Gourmet baby food. The delicious flavors will please even the pickiest pallets. My little picky eater loves every single one. and Harvest Pear, Pumpkin and Banana. and Apple, Sweet Potato, Berry Swirl. 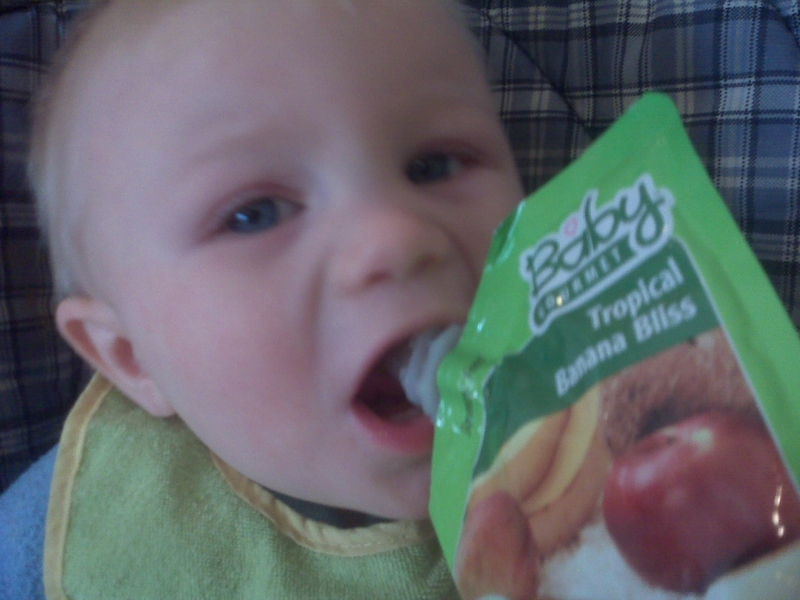 Camrin’s favorite is Tropical Banana Bliss. Tropical Banana Bliss is made with organic bananas, organic mango, organic apple, organic lemon juice concentrate, organic natural flavor and ascorbic acid. We also love the handy Squeeze & Feed technology. Jar baby foods can get messy especially if they are tipped over by a very active baby. You can avoid this by placing the food in a small bowl, but then that creates more dishes for you to wash. 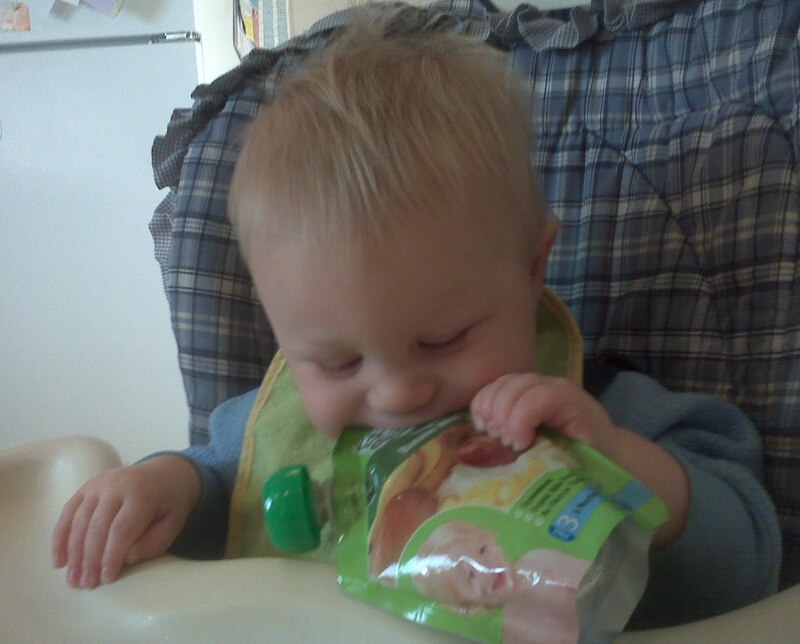 The Squeeze & Feed is less messy and makes it easy for your baby to feed himself. Cam loves trying to feed himself. Parents can purchase Baby Gourmet at their local Walmart® Supercenter and online at www.babygourmet.com. Healthy Moms Magazine readers can also enter to win a sample pack of Baby Gourmet baby food. All you need to do is like Baby Gourmet on Facebook, follow Baby Gourmet on Twitter and leave us a comment to enter. This contest is open to US and Canadian residents only and ends on November 25, 2011 at 8am PST. For every entry including extra entries please leave a separate comment. Winners will be chosen randomly from the comments and e mails that I receive. The contest ends on November 25 , 2011 at 8am PST and is open to anyone in the US and Canada. Please leave your e mail address in your comments. All comments without e mail addresses will be disqualified. 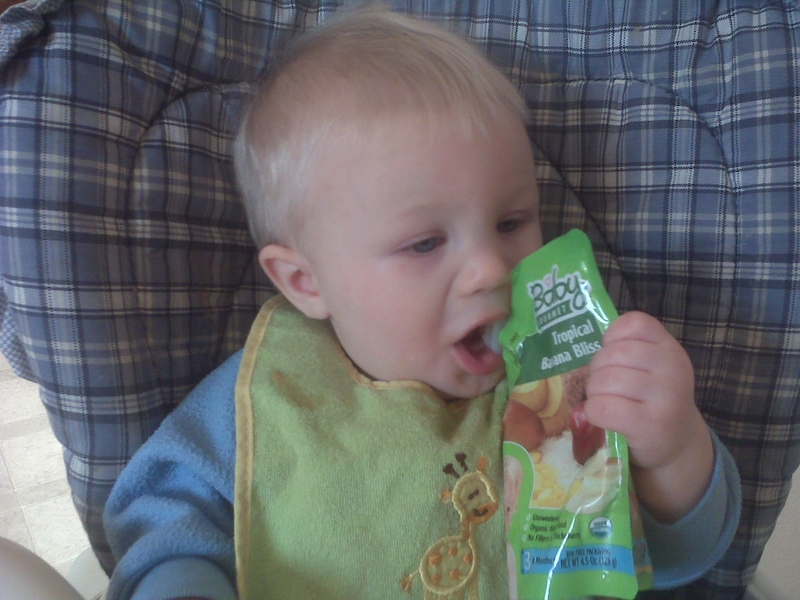 *Disclosure: I received a sample pack of Baby Gourmet baby food in exchange for this review. All opinions are accurate and 100% mine. Liked Baby Gourmet on FB. @hazelfinn follows @babygourmet on Twitter. Subscribed to our Healthy Living Newsletter. @hazelfinn follows @cltalbert on Twitter. Liked The Healthy Moms Magazine on FB. I liked and followed Baby Gourmet! Thanks for the contest!